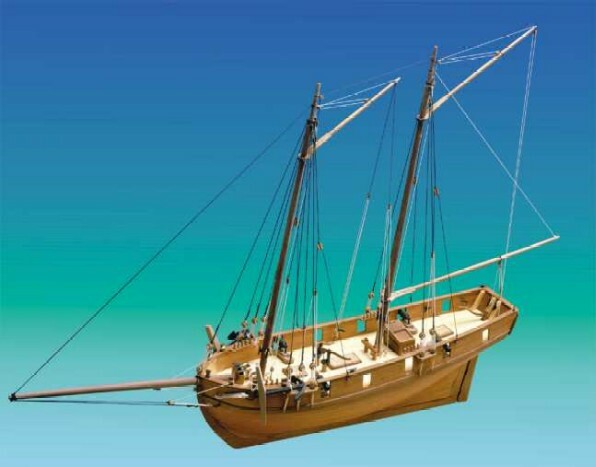 Jotika 9013 Nelson’s Navy HM Schooner Ballahoo 1:64 scale! Four 12 pdr carronades; Walnut CNC cut parts; Double plank on bulkhead construction; Black & natural hemp for rigging. Full size plans and comprehensive instruction manual, making this kit the ideal introduction to plank on bulkhead modelling. Ballahoo was the named schooner of its class of ‘Fish’ Class Schooners built in Bermuda, of which 17 were built to the same design. Ballahoo was ordered in 1803 and launched in 1804. She was commissioned as an armed dispatch schooner. She was 55.4 feet long and displaced 71 tonnes. With a compliment of 20 men Ballahoo was armed with four 12 pounder carronades.